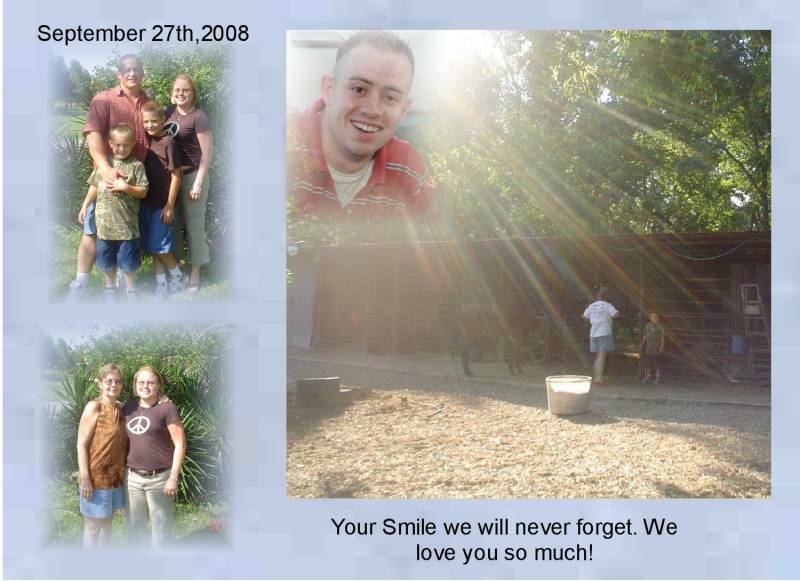 I feel the sun rays was Dustin Smiling upon us today 9/27/08 his smile could always brighten ones day and still does from Heaven Above. Soon the day you left us will be here, tears continue to flow. I know you want me to be strong but you know I cry every day. 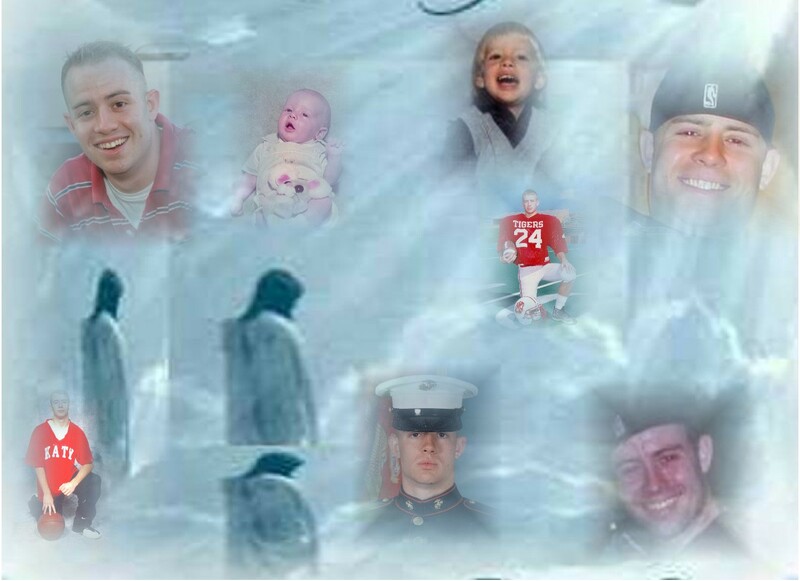 Some moms say it gets easier, some different, but all agree the pain never goes away. A song you loved, a butterfly, a rainbow with no end. Speak to our hearts, my sweet sweet son, tell us what to do. We know you are in heaven with the angels and Jesus, trodding on streets of gold, One day we will join you there, what beauty we will behold. I wake up thinking I hear the last words that was spoken. Ask the Lord to hold me close, help me with the denial. I love you to the moon and back, I'm blowing kisses to you every day.I can close my eyes and see your face. 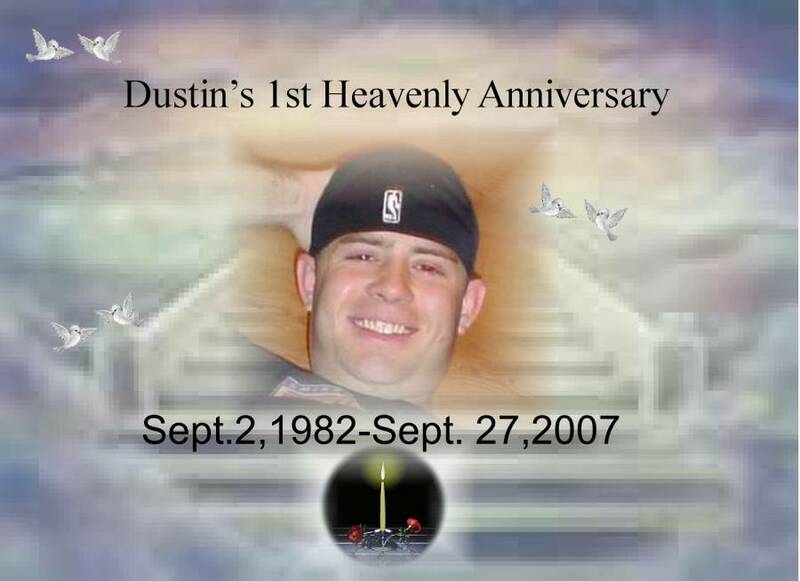 Dear God, I know you know the pain I am in as Dustins's 1st Year In Heaven is approaching. I pray that you will give me the strength I need to get through this day. Dustin's birthday was last Tuesday as you know and that was not to bad but my heart feels the day of his death will not be so good. 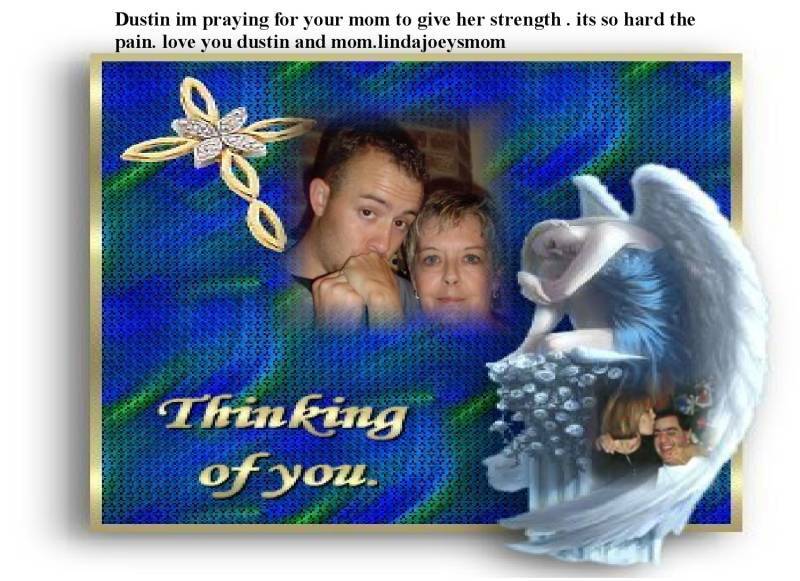 Dustin always thought of me being strong and a survivor so I pray you will help me be for him. I know you took one of the best and he is happy and safe but my heart breaks each and every day. Please give him a hug and tell him I love and miss him so very much. Also thank you for all the mom's that have been so kind and supportive. And give all their angels a hug too! 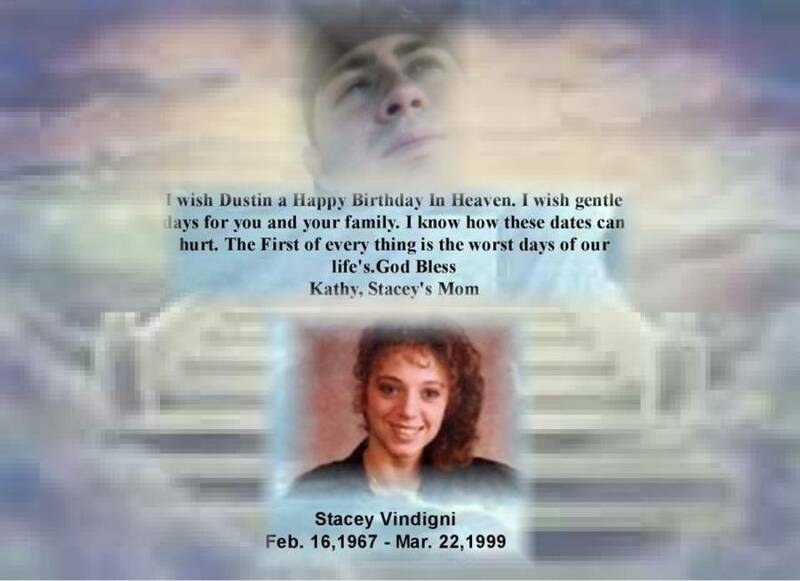 Dustin, I know I can’t be with you on this very special day, but I know you will feel love as I send it your way. I’ll picture you with a smile upon your face And dancing and singing and happy and in so much peace. In a place I can only imagine the beauty and grace. 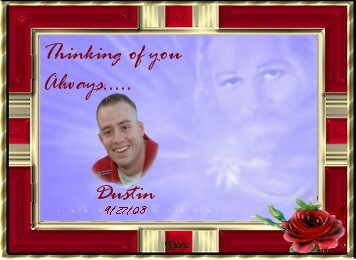 I know you took a piece of my heart, as I have kept a piece of yours waiting to see you as I walk through heavens doors.A year has gone and I’m remembering about days of many years ago, wishing I could say once more, “Dustin, I love you so!” My heart is still broken ,I miss you, Dustin, so very much; this year has been so hard and yet I have to face the fact that we have to be apart. 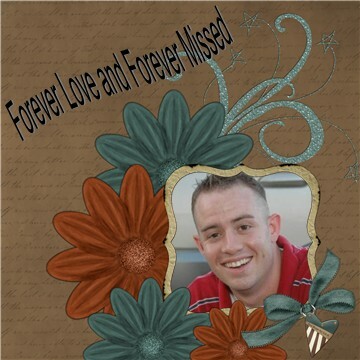 But by God’s grace I know someday we’ll meet in heaven and, Dustin we’ll talk and laugh as before. But until the time that Jesus calls my name, I’ll keep holding to the promise that I’ll see you once again! 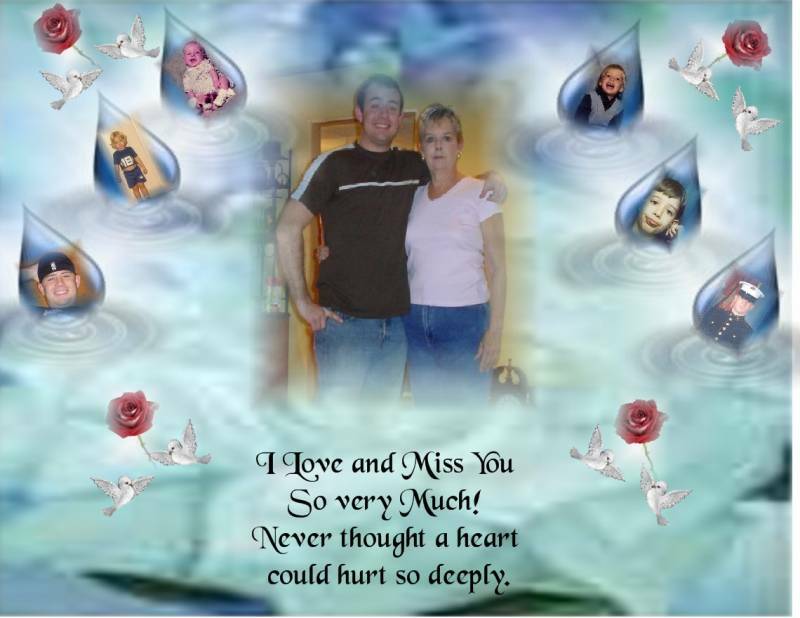 Patti,Just a note to let you know I am thinking of you as you remember the day your Precious Angel Dustin gained his wings. I pray the day goes peacefully for you and that you have many signs that he is near. 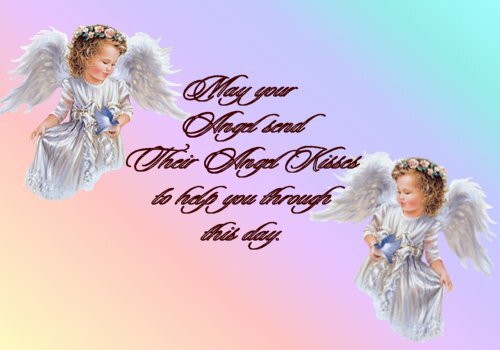 May you feel his angel kisses and hugs on the breeze that touches your face. Don't let grief consume your life. No sorrow or no strife. It's but the very start. To hold within your heart. It's a ye year with God and glory. But the beginning of my story. I am with you everywhere. I'm by your side to share. The one's I loved so dear. Singing a lullaby so sweet. While sitting at your feet. Please try to turn around. Has brought me to hollowed ground. Was what God planned for me. 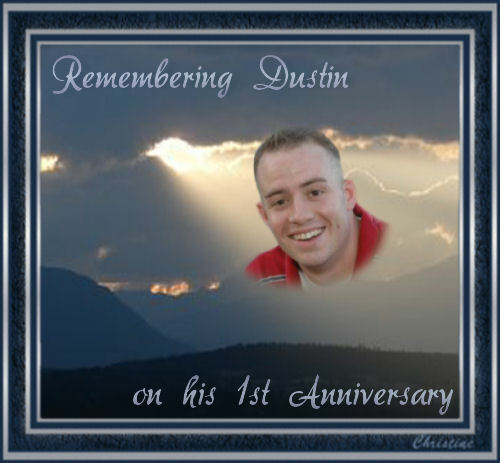 Patti, my love and thoughts are with you as Dustin's first anniversary approaches. 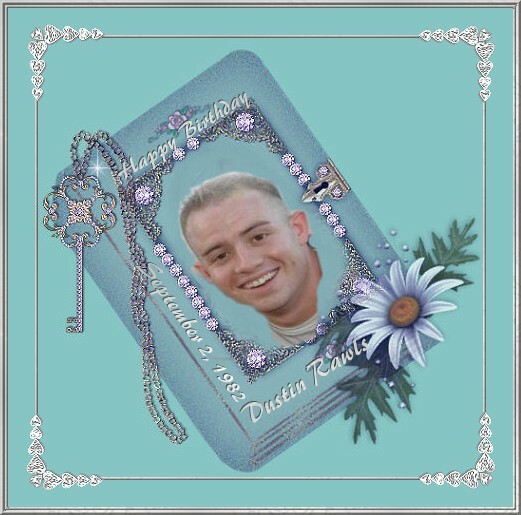 I pray that you will have a gentle day filled with love and many wonderful signs from Dustin..I know he will be with you, giving you strength and helping you through this very difficult day. 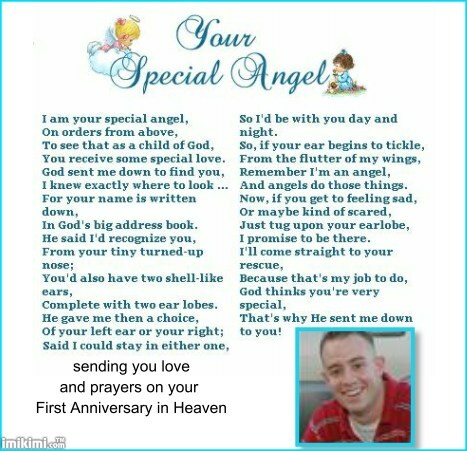 Heres a little gift for you on Dustin's first Angelversary , my you feel his presence hugging you on that day. 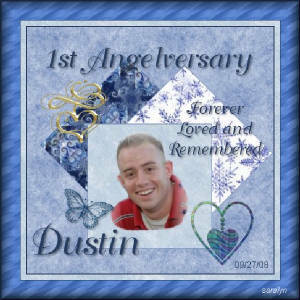 Thinking of you as Dustin's one year angelversary approaches. 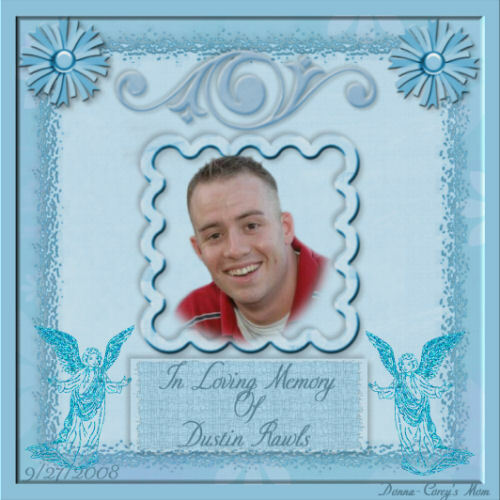 I pray that you feel your angel around you and that Dustin sends you a sign of his eternal love. 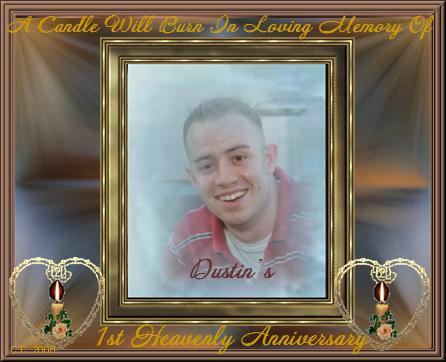 Here is a gift in loving memory of Dustin. May you find comfort in knowing that Dustin will never be forgotten. 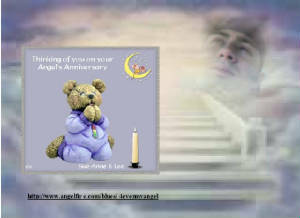 The first anniversary is truly difficult---in some ways, it is worse than the day your angel died, for on that day, you were blessedly numb and did not feel the full extent of your loss; it probably did not even seem real to you. I will be holding you in prayer as Dustin's first anniversary approaches, praying that God will hold you close to His side, granting you His peace, comfort, and strength. Please do not hesitate to ask for our prayers and support; we are all traveling this same road, though some of us, such as me, have been on the road for many years now. Dearest Patti here is a small gift for your Dustin . 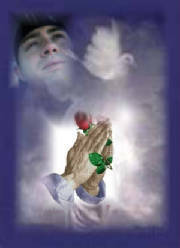 You will continute to be in thoughts and prayers as Dustin's dates approches . Upon my souls sweet flight. The fear now is gone.